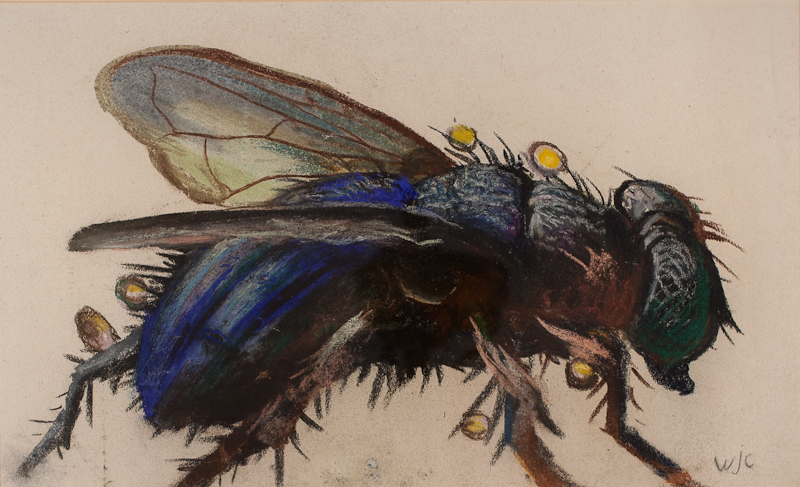 For those familiar with the work of William John Caparne this oversized study of a Blue Bottle Fly (Calliphora vomitoria) may not be what you quite expect. Caparne is well known for his vibrant watercolours of the Guernsey coastline and flower illustrations. However his interest in nature was not purely artistic. Caparne was also a well respected horticulturalist, specialising in iris and daffodil cultivation. As a successful breeder of these particular species he would have also viewed nature from a scientific viewpoint. Caparne would have been familiar with insects that helped the plant breeding process. The insects we first think of are bees and butterflies, and from an artistic viewpoint these would appear to be much more aesthetic than the humble fly. It is however this much maligned iridescent creature which catches Caparne's eye. Perhaps it is the specks of pollen stuck to its bristle-like hair which interests him. Studies such as these were also useful teaching aids, so this could also be a hangover from Caparne's former career as a teacher at Oundle. Flies are attracted to smells that humans find foul. This means they can be drawn to flowers which emit unpleasant odours and consequently aid the pollination of these particular plants. 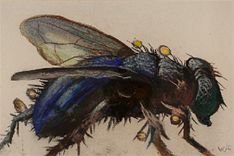 Describing the fly in this larger than life format allows Caparne to celebrate the contours, colours and textures of this insect in an expressive as well as scientific way. He achieves what artists and illustrators have done for centuries, heightening our awareness of the world around us.